MASTER TOP END KIT FOR SBC CHEVY ALUMINUM OR CAST IRON HEADS. FELPRO 1003 HEAD GASKETS, FELPRO 1206 INTAKE GASKETS, & STAINLESS HARDWARE, & ARP HEAD BOLTS INCLUDED. The picture above is a file photo. Actual appearance may vary. 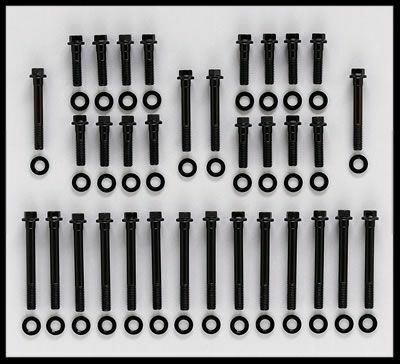 THIS TOP END KIT IS NEEDED WHEN INSTALLING A SET OF OUR NKB OR OTHER ALUMINUM HEADS ON YOUR GEN 1 SMALL BLOCK CHEVY AS WELL AS MOST CAST IRON HEADS. THIS IS THE CORRECT KIT FOR OUR NKB-200 HEADS, DUE TO THE INTAKE GASKET SIZE. The head gaskets in this kit are excellent for those with engines up to around 13.5:1 compression ratio. We have used them for many years, with zero failures reported. Please read this complete ad before purchasing. We use ARP head bolts in every engine we build. As you can see in the picture above, the ARP bolt set has the correct length bolts for most all sbc heads on the market. Port Height (in): 2.210 in. Port Width (in): 1.310 in. This top end kit is suitable for use with our non-steam hole NKB aluminum heads and many other aftermarket heads on the market that call for the 1206 intake gaskets. We do offer this kit with head studs. We strongly recommend that you avoid using the TEK kit that has head studs unless you are very skilled at sealing them. This kit with the traditional ARP head bolts is all you need for any engine build. This kit has our premium race grade Felpro 1003 head gaskets, which are of excellent quality and totally suitable for use with aluminum heads. They are .040 thick uncompressed. 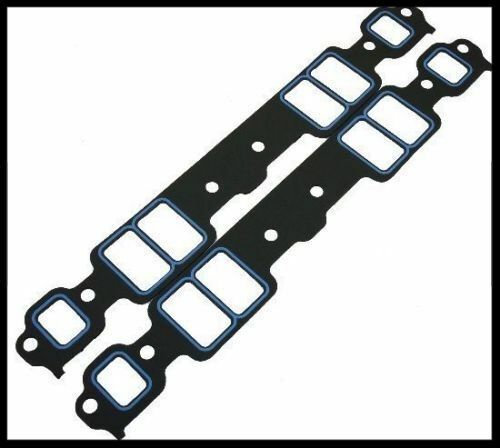 The Felpro 1003 head gaskets are our most popular. Our high end engines all use this series of gasket. We offer a lower cost top end kit for milder builds in our other listings. 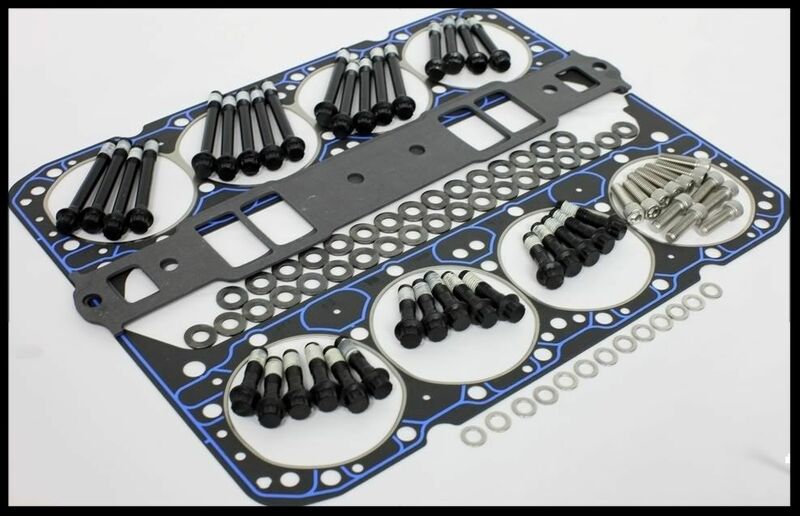 We also offer this kit with a .030 thick head gasket, an excellent solution for those with pistons sitting anywhere from .005 or more below the deck surface. It is most desirable to have your quench/squish zone in the range of approx. .035-.045 if possible. You will see the number 30 or 40 in the part number of the TEK kit and this identifies the head gasket thickness. We have a vast amount of experience using these head gaskets, and have yet to experience a problem. If you're not sure what type is most suitable for your application, please give our tech. support dept. a call. Please read this complete ad before purchasing. We do offer these kits with head studs, but as mentioned you should be skilled in the installation of them to avoid leaks. The Felpro 1206 intake gaskets included in this kit are a perfect match for our NKB heads and many other heads on the market. Should your intake sit too low when mounted, then you will require the Felpro 1266 intake gaskets. See our other listings. IMPORTANT NOTE ABOUT THE ARP HEAD BOLTS FROM OUR COMPANY PRESIDENT, SKIP WHITE. 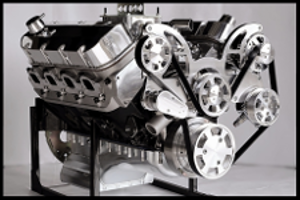 This article is based on feedback from our six engine builders who have used the ARP head bolts as well as the low cost ones that have flooded the market. The differences are dramatic, to say the least. 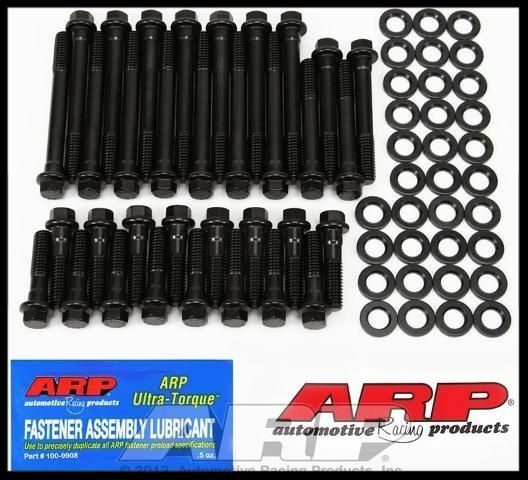 We find the ARP head bolts to be superior in every way compared to the low cost head bolts on the market. Every engine we build uses them, including our base model 350 and 383 engines. Our engine builders first noticed the general feel of the ARP head bolts to be much smoother than the low cost head bolts when torquing them down. This smooth feel is sure to give more accurate torque readings. The head bolt washers on the ARP set are another great feature. They have a well designed chamfering in the center. The chamfered center intersects perfectly with the radius in the head bolt. The thick radius in these head bolts is part of what makes them very strong. These specially designed extra thick washers are very important on aluminum heads. They allow the head bolts to have a glide surface to prevent gouging into the aluminum head. This is another reason these bolts will give more accurate torque readings, in our opinion. There are a couple of bolt holes in the center on most aluminum heads that have an inherent weakness. Due to the location of these holes, the casting is usually much thinner to give way to the raised water jackets, which are usually raised to give way to larger than normal runners. Using head bolts without washers can crack the casting in this marginal area. The thick, wide washers not only prevent the bolts from gouging into the head, they also distribute the pressure over a larger area as compared to the smaller bolt head. When the head bolt tightens down without a washer, the twisting force of the head will gouge into the surface of the aluminum, further weakening this area, and can cause it to crack. We know first hand of this happening with a brand of cylinder heads we once carried about 10 years ago. We had $18,000 worth of warranty claims on these heads over a year's time. These heads had multiple cracks around the center bolt holes. 100% of these heads had used head bolts without washers. At that point, we insisted on the use of ARP or an equivalent head bolt with the special washers. Zero failures from that point on. As mentioned, this is an inherently weak area on most aluminum heads, some more than others. Some of the low cost head bolt sets on the market do include washers, but they are not designed well, from what we have seen. The chamfering in the center of these washers did not mate up properly with the radius under the head of the bolt. This caused the washer to flare up slightly on the edges when torquing the bolt down, therefore defeating much of the washer's purpose. It's better than no washer at all, but it's poorly designed compared to the ARP sets. When we torque plate hone our blocks, we use the ARP head bolts. We once tried the low cost head bolts, and noticed after just a few uses, they had stretched and deformed the threads so badly they couldn't be used again. We can use the ARP head bolts many times before replacing them. 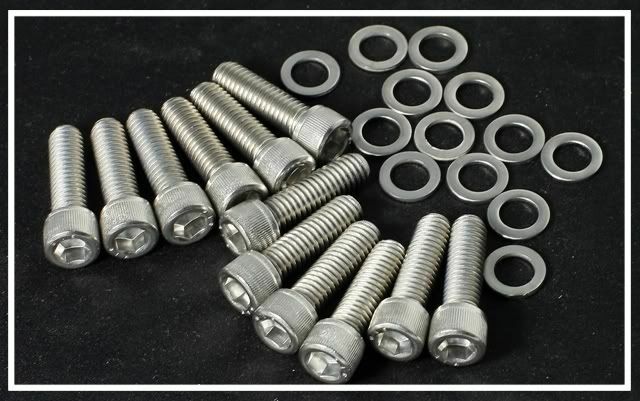 We have sold the low cost head bolts for many years, and find them to be sufficient for those on a budget doing a mild engine build that will not encounter hard usage, but we do not advise using them on engines with over 10:1 compression ratio. We also do not recommend them on engines with aluminum heads due to the poor washer design. Consistent clamping force on each bolt is of paramount importance for proper performance and reliability of an engine. For many reasons, mostly the very well designed threads, the ARP head bolts will give you this consistency.